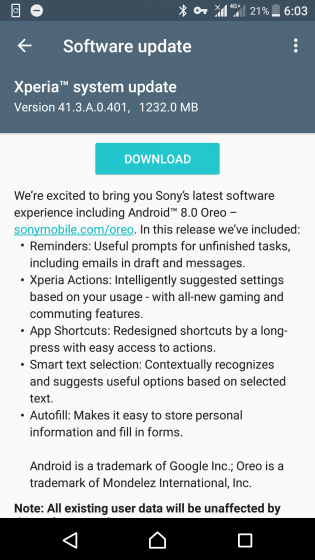 An Oreo update was previously announced for the Xperia XZ and XZs, but now it's actually rolling out to users. The build number for both updates is 41.3.A.0.401, and they are around 1.2GB in size. The November 1 security patch level is included. Sadly, it doesn't look like Project Treble support has been added (at least for the XZ). Android 8.0 Oreo will likely arrive on the X Performance next, due to the phone sharing build numbers and most specifications with the XZ and XZs. 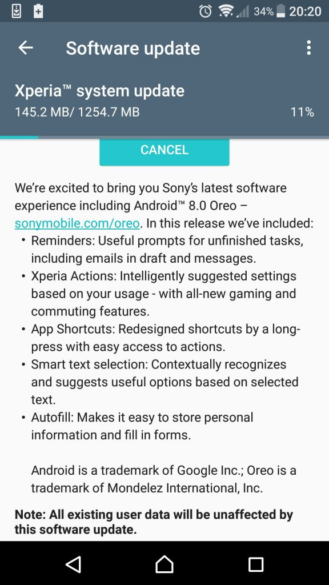 The Xperia X Performance is starting to receive its update to Android 8.0 Oreo now, too. Both single and dual SIM variants should be starting to see the build number 41.3.A.0.401.